Home improvement or remodeling as we all know can be a major investment. Building from scratch or renovations to an existing home usually comes with a hefty price tag. My family and I are currently attempting to work through issues such as this and hopefully this entry will also give you and your project a couple of money saving ideas. Since the beginning of this year, our family has been diligently working on renovating a house out at the family farm. although its been a lot of work and still even more to come, we are very much looking forward to moving out here. We will be out of town! Finally able to get away from annoying neighbors and pesky juveniles, lame city ordinances (did you know its unlawful to have grass on the street in front of your house after you mow??? ), and traffic speeding by while kids are at play. We look forward to quiet starry nights on the prairie, privacy from the general public, and I don't have to worry about the kids getting hit by a car. Clean out the home- it was being used as storage for the family. We are working on removing and sorting the items. Fix water main and heating element- this we found after putting the water in our name. Clean entire home top to bottom- obviously. Remove cabinets/counters/ appliances from kitchen- the ones in there now are made out of panelling.... I think the manufacturer would have used card board but people may have complained. Replace sub-floor and floors- we have torn up carpet/linoleum already. Replace kitchen amenities- so we can eat. Paint- I am super excited for this, I get to paint any color in any room and no manager can tell me no!! (Well Cully can say no, but he would have a good reason to do so). Then we can move in..... which I have our goal as the end of August... so its going to be a busy summer! As you can see we have plenty to do and because of that we have a huge materials list. Most of the expense is going to be the floor and kitchen, but I think I may have come up with alternatives to an expensive kitchen set and that is why I am writing on this subject. I want to share the resources I use to save us money.... because like most of us we don't have much extra to throw away on solid mahogany cupboards or granite counter tops. This is a great site for buying anything small. I emphasize the word "small". Ebay is where you go to find bulk boxes of drywall screws or lighting fixtures. Prices can be pretty affordable, but buyers need to watch shipping costs. Obviously the heavier the item, more cost for shipping... Ebay would not be the place to purchase lumber. Also keep an eye out for sellers listing something for extremely cheap, only to hit you with a insane shipping cost. (I once saw a swing set for a dollar... with a 399.99 shipping rate) Auctions like this are illegal and should be reported. On the other hand, many sellers now offer free shipping. Renovating a modular home outside of town and we are on a tight budget. 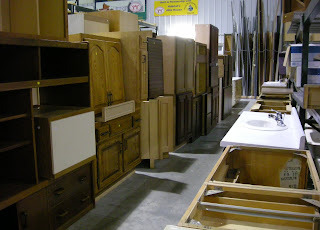 We are looking for some used lower cabinets with or without counter tops. We are not picky on materials, color, design... we just need cabinets :) Current ones are 24" deep, we have a space of about 12 feet in length. We have very little to spend, so the ideal find would be use-able items from someone who recently upgraded their kitchen/floors and would otherwise be throwing items away. Please contact me with specifics, we would be able to pick-up/haul. A few clicks, some post moderation, email confirmations and you are set! Just wait for people to respond. As I mentioned, very few people on Craigslist are killers/kidnappers, but you still need to use common sense. If someone is posting a "1994 Olds Sierra" to "give away" its most likely a scam. Ads like this will ask you to email them (like every other ad on the site), but when they respond it asks you to click a link and watch an advertisement/video.... DO NOT CLICK ANY LINK SENT TO YOU IN AN EMAIL!!!! I cannot stress this enough!!! Links like this can be harmful to your computer and your personal identity. If the seller cannot send you information and pictures within the email.... its most likely a scam. Craigslist is a touch and go source for items, but the more you get the word out the better chance you have of locating stuff you can use for more than half the cost. This is one of my favorite places to look for building materials. The ReStore specializes in home improvement items and relies purely on donations. Also, the proceeds they raise from selling the donated products is put towards construction of new Habitat for Humanity homes in the area. Most items are new at a huge discount. Items will vary by location of course because they are based off donations. For example, the store in Sioux Falls, SD usually has a a large surplus of paint and carpet remnants, but they also carry cupboards, vanities, doors, windows, etc. First step for anyone interested is to check out their local store. Some locations (like Sioux Falls) have email newsletters you can sign up for. Every other week I get an email showing a new or on sale product. This option is really nice as Sioux Falls is about 90 minutes away. If I see something that peaks my interest I just email the store, ask what the cost is and see if it is worth the trip. Normally, by checking here you can save at least 40% off retail prices. "Our mission is to build a worldwide gifting movement that reduces waste, saves precious resources & eases the burden on our landfills while enabling our members to benefit from the strength of a larger community." The Freecycle Network™ is made up of 4,958 groups with 8,524,583 members around the world. It's a grassroots and entirely nonprofit movement of people who are giving (and getting) stuff for free in their own towns. It's all about reuse and keeping good stuff out of landfills. Each local group is moderated by local volunteers (them's good people). Membership is free (From Freecycle.org). Upon your first visit you will want to find a group that is near you and join it. You may need a yahoo user name, but I am able to login with Facebook so there is a good chance that should work as well. Sign up for the group closest to your home, that way you aren't driving across states to pick up stuff. Occasionally there will not be a group near you, just pick the closest and any time you post mention your location. Looking for some small to medium cardboard boxes in Watertown area. It would be great if they were broken down, but I can do that as well. I also can pick up or meet somewhere. It is really that simple. Make sure you list if you are "Giving away" or "Wanted/Needed" so people know by the post title what your intention is. Also, if you have posted something, keep it updated. Giveaways should always be changed to "Taken" or "Picked up". If you want something, its always an added bonus to be willing to pick it up. People will contact you through the Freecycle post which will be delivered to your personal email. I hope this has been a useful guide, in my experiences all of these outlets have been helpful. Hopefully they will be an asset to you as well! With the holiday weekend I didn't get as many post done as I would have liked to. I am hoping to get more done this week. Become a follower and check back often for new posts! !